Prices for the heavy metal were already on the decline in 2011, when the Fukushima disaster in Japan soured that nation, and much of the world, on nuclear power. Germany soon announced plans to shutter all its nuclear plants, and other European nations joined the anti-nuke chorus. Uranium prices have fallen by half since the tsunami. Even while demand increases, supply is drying up. In December, Russia sold its last load of uranium to the U.S., ending a 20-year agreement to enrich fuel from warheads. That Russian uranium stash— at roughly 24 million pounds per year, equivalent to the largest uranium mines of the world—is no more. The supply/demand shift is great news for Canadian uranium mining giant Cameco (ticker: CCJ). Mining companies will need to meet global demand expected to climb from around 170 million pounds today to 220 million pounds over the next decade, and Cameco's production costs are half that of the industry average. Cameco's massive mining operations—mostly in Canada, but also in the U.S. and Kazakhstan—put it among the top three uranium producing companies globally. Its McArthur River/Key Lake mining operation in Canada is the largest uranium complex in the world, and Cameco also is developing Canada's giant Cigar Lake mine, coveted for its high-grade uranium. In the meantime, Cameco has production commitments into 2016 that put a floor under earnings. The company produces more than 20 million pounds of uranium annually and hopes to increase its annual supply to 36 million pounds by 2018. In Cameco last month, Barron's Roundtable member Fred Hickey pointed out that, because the company's cost of production is so low, it is able to earn a nice return even at today's price of around $36 a pound, down from $70 in 2011. Yet Cameco shares—cut in half since 2011—don't reflect the company's growth prospects. Hickey, who often is attracted to contrarian opportunities, called uranium mining a "hated segment." "The uranium price went below the marginal cost of production … [which is] a good time to get involved in any commodity," says James Hunt, who owns Cameco shares in the Tocqueville International Value Fund. "Cameco is coming out of a period of elevated capital expenditures. So rising prices combined with reduced capex means free cash flow should expand a lot." 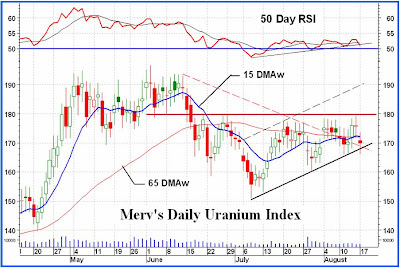 The improving uranium scenario will not show up immediately on the income statement. Analysts expect earnings to fall 28% this year. At 22 times 2014 estimates of 92 cents per share, the price/earnings ratio reflects a low point in the uranium pricing cycle. Analysts are projecting a recovery in earnings to $1.10 per share in 2015. Using the current multiple on that estimate, the stock would trade just below the average analyst target price of $25, up from a recent $20.50. And as prices firm, estimates on which targets are based should move higher. In addition to the improving supply/demand dynamics, Cameco has other tailwinds. After years of delay, the Cigar Lake facility, in which Cameco has a 50% stake, is scheduled to start producing uranium in the next few months. The company is selling its stake in four reactors, to focus on production. And shares yield 1.8%. To be sure, Cameco faces potential obstacles. The company reports earnings results after the close Friday, which could lead to short-term volatility. And an election in Japan Sunday also will be closely watched, with an anti-nuke candidate in Tokyo challenging Prime Minister Shinzo Abe's nuclear agenda. The dangers of radiation contamination are frighteningly real. The Fukushima fog, as CFO Grant Isaac recently called it, is clouding the timing of the transition to a demand-driven market where Cameco will have pricing power. Cameco shares have been stuck in this fog for two years. But even in Japan, the pro-nuke position made headway in the latest campaign season. And as uranium demand strengthens globally, Cameco's shares should pick up, too. Like all of Bamford’s watches, these new replica watches sale Heritage watches will be divisive. I can already hear naysayers cry, “As if butchering a Rolex isn’t bad replica watches sale enough, these watches are copying from vintage Rolex watches!” They have a point, but the way I see it, it’s a way for vintage Rolex owners to own something that looks like a vintage model from Rolex (and it replica watches sale actually is a Rolex underneath) that's freshened up without being a totally blacked-out Bamford. The replica watches sale lineup for Wilsons Auctions Unreserved Prestige Auction on Friday 27th May, 2016, at 6pm is now live online and features a range of beautiful watches, including dozens of Rolex timepieces, along with swiss replica watches some of our favourites which we’ve outlined below. This is a unique opportunity to purchase a luxury watch at auction prices replica watches with no reserve, meaning you could get the watch you’ve always dreamed of at a much reduced price.